Rich, moist coconut surrounded by a thick layer of chocolaty coating. It tastes just like your favourite coconut candy bar, without one bite of regret. Great product. Will purchase again. I have bought these a few times and love them. Great for a treat once in awhile. Tastes good without too much of a sugary taste. Love these. Not overly sweet. Very satisfying when I have a craving for dessert. These are simply delicious if you love coconut. It tastes more like coconut, less like sugar than the chocolate bars are and a little better for you. Can't go wrong. Absolutely delicious. Great with a cup of coffee. No aftertaste, tastes like a chocolate bar, but with 5 grams of protein. Very delicious treat. Thanks for making me feel like I am not missing out. These are the perfect size and taste. I am crazy for coconut and chocolate and these are very satisfying. A delicious indulgance! I happen to love coconut and these bars taste great. I always make sure to keep one or two with me to snack on throughout the day! I was expecting something "ok" tasting but IMO these bars are even tastier than bounty bars even without all the sugar. Amazing! I actually loved these bars! They do taste like a Bounty Bar, only with dark chocolate. I would purchase them again, and I also recommend them. A good replacement for bounty bars and decently filling. Love these bars...I tried to buy them where I live but you can only get singles. So when I seen these here, on sale...a bonus..I ordered them ..So easy..I love shopping here. Thanks for the great service. As below these bars are similar to Mounds or Bounty in the coconut taste, can't taste the sweetener. 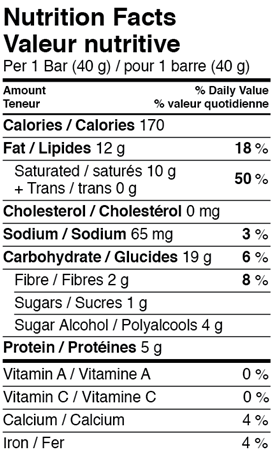 The 2 net grams of carbs are key, as was getting them on sale. I will get again and again try then your self and see ;). Love, Love, Love this product. Its so good, it tastes like a chocolate bar. 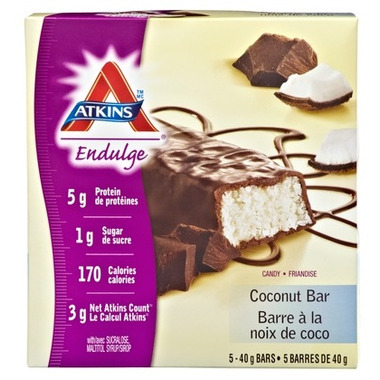 My fav Atkins bars! Delicious and reasonably priced too! This is an excellent product, where I can also buy elsewhere but no one can beat your price!! These are delicious! If you like "Bounty" chocolate bars you will find these to be a great substitute and they only have 2 grams of carbs.